We offer PC-mount transformers in a number of configurations to meet both the power and dimension requirements of your electronics projects. In addition to the iron-core, through-hole transformers described on this page, we also manufacture surface-mount transformers in an array of configurations. 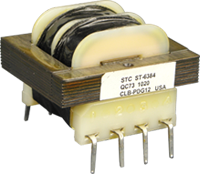 Low-profile PCB-mount transformers (LPCs) are designed to take up minimal vertical space. These types of transformers can be used for nearly any printed circuit board configuration where a slim overhead design is required. The semi-toroidal construction helps reduce hum as well as radiated magnetic fields. Low Profile: Only .65 inches tall. Semi-toroidal Construction: Hum-Bucking construction, reduces radiated magnetic fields. Non-concentric windings: Reduces inter-winding capacitance and eliminates the need for electroctatic shield. 1500 Volts RMS HIPOT: Primary and secondary coils wound on separate sections. Wide selection of outputs available: Selection ranges from 5 to 230 volts standard. 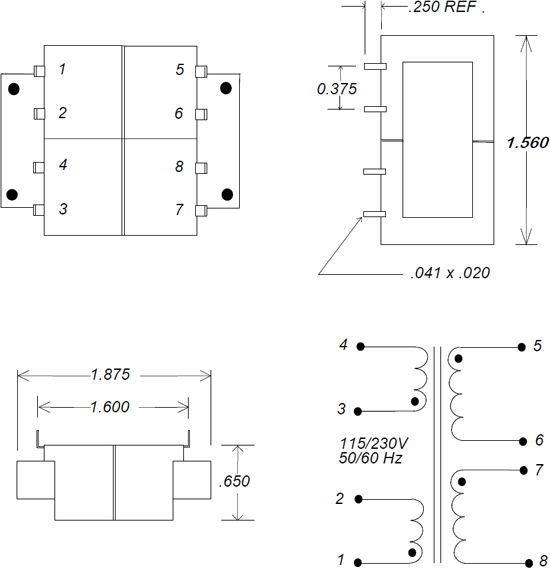 Custom Configurations Available – Contact Sun Transformer for details. Low Profile: Only .81 inches tall. Allows one-inch card spacing. Custom Configurations Available. Contact Sun Transformer for details. Low Profile: Only 1.05 inches tall. Low Profile: Only 1.375 inches tall. All of our LPC transformers are UL recognized, and we offer UL approval for existing or new transformer designs (for an additional fee). Please review the LPC data sheets for detailed specifications. These horizontal PC-mount transformers deliver 2,500V RMS hipot, and their two-section bobbin offers efficient manufacturing, which results in a lower price point. 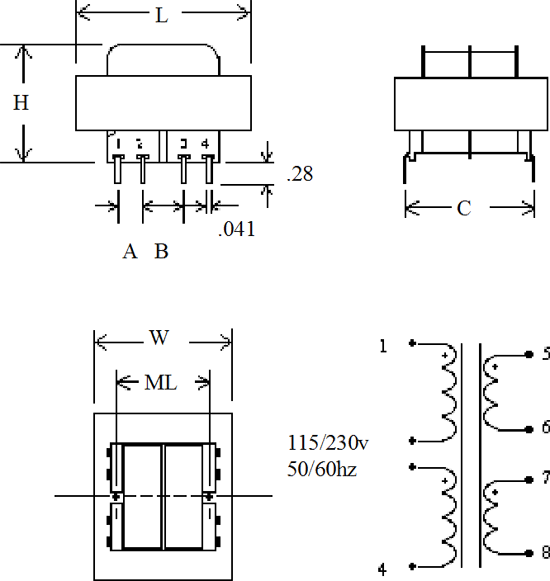 As shown in the drop-down table, output selections range from 5 to 120 volts standard. Low Cost: Two-section bobbin allows efficient manufacturing. Non-Concentric windings: Reduces inter-winding capacitance and eliminates need for electrostatic shield. 2500 volt RMS HIPOT: Primary and secondary coils wound on separate sections. 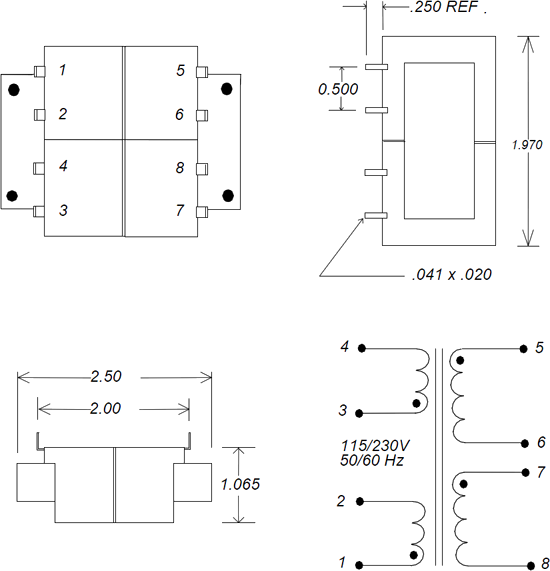 Wide selection of outputs available: Selection ranges from 5 to 120 volts standard. wt. 2.8 oz. 4.0 oz. 7.1 oz. 11.2 oz. 12.8 oz. 17.6 oz. 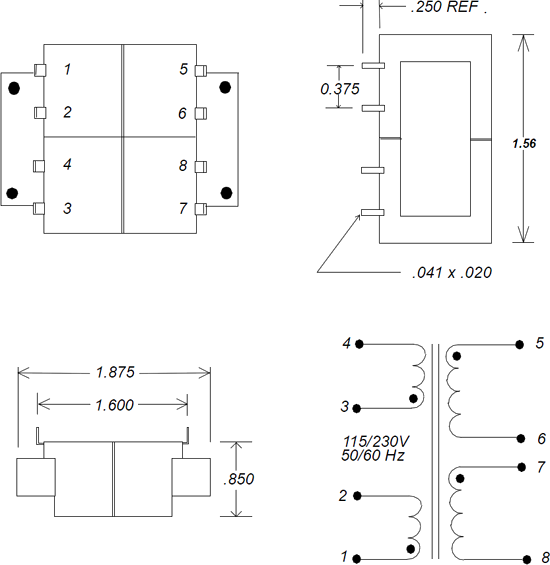 These PC-mount transformers meet international isolation standards. They utilize an E-I laminate core and offer an effective alternative to LPC-style transformers when greater output power is needed and vertical space is not quite as limiting. 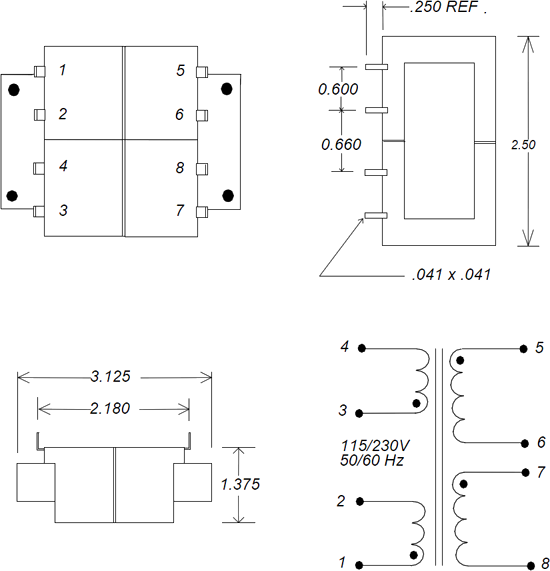 Sun Transformer can design and manufacture PC-mount transformers to meet nearly any requirement. For more information about how we can provide your transformer needs, please send us your specifications or call us today! All Sun Transformer products are available lead-free and RoHS compliant upon request.